Dyslexics are teaple poo...er, people too, we mean. This is a very funny t-shirt that pokes a bit of fun at your little dyslexic issues. Nice comix lettering and a hilarious saying makes this a really fun shirt to wear. We have them available in dark and light shirts and in all sizes for men, women and children too. Our Dyslexics are teople poo design is also available on lots of fun items like mugs, buttons and even a banner poster that makes a great wall hanging for dorm rooms. 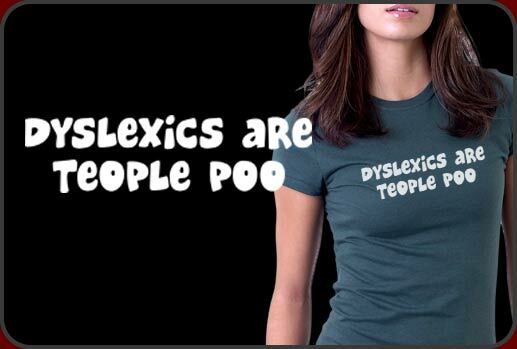 If you are slightly dyslexic won't you help us raise awareness of this terrible affliction by purchasing a Dyselxics are teople poo shirt of your own?